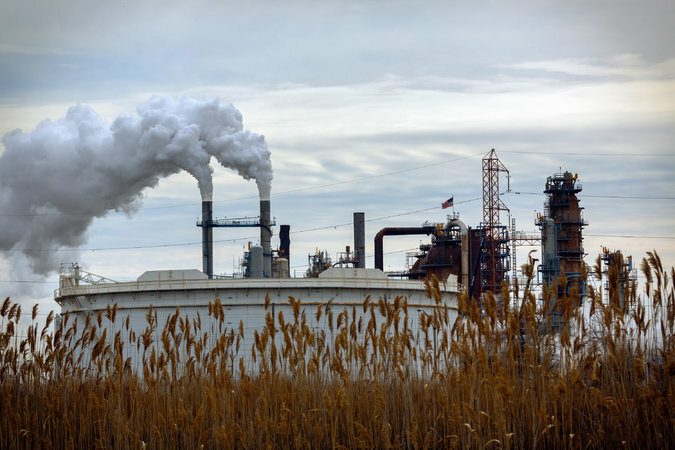 The Bayway refinery in Linden, N.J., is among the sites that was owned by Exxon that were at issue in lawsuits the State of New Jersey filed against the company over long-term environmental contamination. In summer 2012, lawyers for Exxon Mobil Corporation gathered in a state office building in Trenton, ready to hear what the State of New Jersey might be willing to accept in exchange for making a long-running environmental pollution case go away. By then, a judge had already held Exxon liable for potential damages in the contamination of more than 1,000 acres of land at refinery sites in Bayonne and Linden. In court, the state was seeking $8.9 billion, including more than $2 billion for the primary restoration of the properties. But the figure proposed by the state at the meeting in Trenton fell far short of that. The administration of Gov. Chris Christie, in its first formal settlement offer, said it would accept $325 million, according to a senior administration official and a representative of Exxon. Exxon rejected the offer. The meeting, which has not previously been disclosed, shows that the Christie administration had pushed for over two years to settle the case for much less than the state was seeking in court. New Jersey agreed last month to settle the litigation for $225 million, prompting broad criticism that the Christie administration had accepted pennies on the dollar to resolve the hard-fought case. Not only was the sum less than what the state had offered in 2012, but it also came at an odd moment: A ruling on damages was believed to be imminent, after an eight-month trial last year in which the state sought to prove its damages claim. Environmental advocates and some lawmakers have accused Mr. Christie, a Republican, of sacrificing the environment to help the state address more immediate shortfalls in its budget, allegations the Christie administration has vigorously rejected. On Thursday, the Assembly Judiciary Committee will hold a hearing on the proposed settlement, which still requires a judge’s approval. Records of the settlement proposals are not public; the state official and other people interviewed for this article who had knowledge of the negotiations spoke on the condition of anonymity because the talks were also not public. Whatever the political and legal analysis that led to the $225 million deal, the seeds of an agreement were planted years earlier. Familiar to drivers on the New Jersey Turnpike, the Linden refinery, known as Bayway, has reinforced the popular notion of the state as almost irretrievably toxic. There, marshland adjacent to a creek was “now mostly covered with a tar of petroleum products or filled with other hazardous constituents and debris,” according to a state environmental official quoted in a 2006 affidavit. He also cited 45 acres of “sludge lagoons,” former tidal marshes that had been used as hazardous-waste disposal facilities. Exxon had agreed in 1991 to remediate, or clean up, both the Bayway and Bayonne sites, subject to state approval, with “no cap” on what it would pay, as Mr. Christie recently pointed out. The company has said that through the end of 2013, it had spent more than $200 million on those cleanup efforts. But the 1991 agreement did not block the state from suing for the loss of natural resources, which it did in 2004. A news release issued at the time said Exxon had “balked at the opportunity” to reach “a reasonable settlement” to resolve liability for the natural resource damage at the sites. The release added that the state’s environmental commissioner, Bradley M. Campbell, had also issued an administrative subpoena for information from Exxon about its “hundreds of potentially contaminated sites to ensure that the public is fully compensated for natural resource damage claims.” The release cited nearly 1,000 gas stations and other sites. As the case moved through the courts, Exxon was held strictly liable, that is, regardless of fault, for the potential costs of restoration and damages to compensate for the public’s “loss of use” of the natural resources. Exxon argued that no damages should be awarded. In spring 2008, the administration of Gov. Jon S. Corzine, a Democrat who was Mr. Christie’s predecessor, made Exxon a settlement offer that the state valued at roughly $550 million (about $150 million in cash and $400 million in land restoration projects), according to the senior Christie administration official. Exxon rejected the proposal. The senior official added that the 2008 offer served as a “framework” for how New Jersey officials would arrive at their 2012 settlement demand of $325 million in cash. The Corzine administration proposal, however, was made before a ruling that greatly bolstered the state’s position on potential damages. In 2009, a judge rejected Exxon’s arguments that New Jersey could only seek damages for contamination that had occurred before the enactment of the 1970s-era law that authorized such suits. That meant the state could seek damages retroactively to when it claimed the contamination had begun: in the 1870s at Bayonne, and the early 1900s at Bayway. Exxon did win a ruling in 2009 that said it was not responsible for natural resource damages caused by physical modifications at the refinery properties. A few years would pass before the possibility of a settlement was broached again. During that time, the attorney general’s office lost the only two natural resource damages cases it had taken to trial, strengthening Exxon’s argument for New Jersey to settle. In April 2012, Exxon’s lead lawyer, Theodore V. Wells Jr., met with Christopher S. Porrino, then an official in the attorney general’s office, to lay out the company’s position. Mr. Wells, co-chairman of the litigation department of the Paul, Weiss, Rifkind, Wharton & Garrison law firm, had been retained in 2006. His argument was that any settlement should fall significantly below $100 million, roughly the aggregate value of all of the state’s natural resource damage settlements from 2004 to that point. He offered data showing that the largest settlement reached by the state in such a case was $17 million, while the average of the 10 highest such deals was $6.3 million. At the meeting in August 2012, Exxon’s team, which had litigated the case through three Democratic administrations, included a new face: George Gilmore, a lawyer and influential fixture of state Republican politics who had served on Mr. Christie’s transition team. Mr. Gilmore had been retained by Exxon after the governor’s election to assist in the case. He ended his relationship with the company before the trial began in 2014. The state’s legal team included Mr. Porrino and John J. Hoffman, another top official in the attorney general’s office. Both would later fill even more senior posts: Mr. Porrino as the governor’s chief counsel and Mr. Hoffman as the acting attorney general. Mr. Wells said in the meeting that he considered the $325 million offer “outrageous,” a person with knowledge of the discussions recalled. Mr. Wells largely repeated the arguments he had made before and said the company did not feel it was being treated fairly or consistently with how other major corporations had been treated in such cases. During these early discussions, Exxon also indicated that it wanted any deal to resolve potential natural resource liability claims related to the gas stations and other sites, where, it asserted, contamination had been minimal. If that were found to be, the state said such claims could be included in a deal. The Christie administration lawyers also made it clear that any settlement had to exceed $100 million for the state to take it seriously. Exxon countered later in 2012 with an offer of $20 million, which the state rejected. In January 2013, at a court hearing in Elizabeth, N.J., Allan Kanner, an outside lawyer retained by the state, told a judge that the parties had made offers, and that Mr. Porrino, who was present in court, had attended all of the meetings. “We just are at an impasse,” Mr. Kanner said. In December 2013, Exxon raised its offer to $66 million, in cash and land, according to one person with knowledge of the settlement talks. The state countered at about $290 million, which also included land. In January 2014, as the damages trial was beginning, Mr. Porrino became Mr. Christie’s counsel. Exxon then raised its offer to $200 million, and as Mr. Wells and Mr. Kanner and their teams continued to fight in court, the settlement was negotiated by other lawyers. The final deal, under which Exxon agreed to pay $225 million, also resolves the state’s claims related to the service stations and other facilities, which the state was now characterizing as “relatively minor,” according to a news release from the attorney general’s office. The state has not released a list of those sites. Mr. Hoffman said last week that had the state not settled the litigation, the matter would be “litigated for many years to come with an uncertain outcome that could threaten the state’s recovery in this case” and would jeopardize other significant natural resource damage recoveries the state was pursuing.